Denmark Adapter Plug Kit has the adapters you will need for traveling to all parts of the stunning country of Denmark. Denmark is located in Northern Europe and uses a unique type of three round pin, grounded adapter plug. However, the non grounded, two round pin, adapter plug is used in many European countries. Denmark Adapter Plug Kit has the adapters you will need for traveling to all parts of the stunning country of Denmark including Copenhagen, Aarhus, Odense, Randers and Herning. The Deluxe kit ships priority mail with tracking. The Denmark adapter plugs allow you to plug your United States appliances and electronics into Denmark wall outlets. The two round pin, non grounded, Europe Adaptor plug allows US, North America, China, Australia and Mexico appliance plugs to be used in Continental Europe such as Denmark, France, Germany and Spain. You will need a two round pin, Continental Europe grounded adapter plug if you are traveling to France, Germany or Spain with a grounded appliance. Denmark operates on 230 volt electricity and is generated at 50Hz (Cycles) Alternating Current. United States 110-120 volt electricity is generated at 60Hz (Cycles) Alternating Current. This difference in cycles may cause the motor in your 60Hz United States appliance to operate slightly slower when used on 50Hz foreign electricity. Most modern electronic equipment including battery chargers, Lenovo, HP, Asus, Toshiba computers, iPods, etc., will not be affected by the difference in cycle. Check your appliances before you travel to see if you need a converter to operate your curling iron. Not using a converter can damage your curling iron or other non dual voltage appliance. Hej Danmark! Denmark is known for its delicious food, Danish pastries come to mind, and its charming fairy tale like towns which were once home to the famous writer Hans Christian Anderson. Denmark is located in Central Northern Europe, bordering the Baltic Sea and the North Sea, on a peninsula north of Germany (Jutland); also includes several major islands (Sjaelland, Fyn, and Bornholm) and its area twice the size of Massachusetts. Its climate is temperate; humid and overcast; mild, windy winters and cool summers. In these summer months there are many outdoor fairs and activities. Winters can be a bit less hospital to tourists looking to see the country side, since the days are shorter and the weather is colder. Spring can also be a great time to visit. The weather is not quite as warm as it is in the summer, however there will be less crowds since it is not a busy tourist season and children will be in school during this time of year. The terrain is low and flat to gently rolling plains. Natural resources include fish, salt, limestone and chalk. Currency in Denmark is the Danish Krone (DKK). Credit cards are generally accepted in major cities. Foreign money and travelers cheques can be exchanged at banks throughout Denmark. Travelers’ cheques are also accepted at some hotels and restaurants. Denmark has excellent telephone and telegraph service and multiple cellular mobile communications system. Cell phone coverage is outstanding. When travelling to Denmark you will want to take an international or unlocked cell phone with a prepaid Denmark SIM card. You can also contact your mobile service provider to set up an international calling plan. You will need an adapter to charge your phone. Most cell phone battery rechargers should be multi-voltage, therefore will not require a converter. If the charger says 100-240 volts, 50-60 cycles then your charger in multi-voltage. Denmark has over 4.285 million internet hosts and over 4.75 million internet users. There is internet access in tourist hotels and internet cafes throughout the major cities. When traveling with your laptop or iPad you will need an adapter to charge your device. 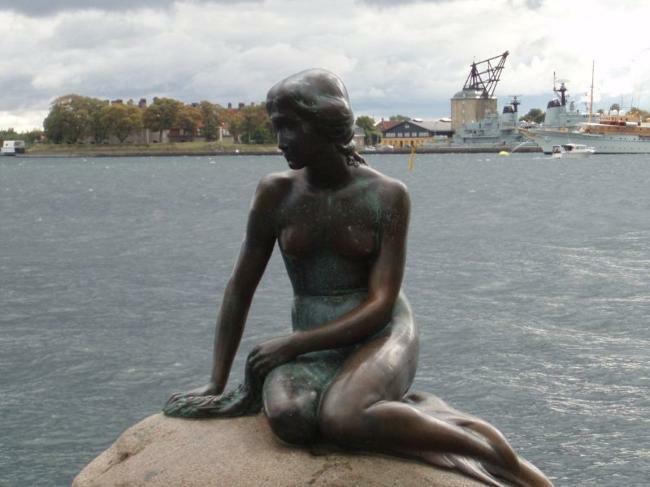 The Little Mermaid Statue in Copenhagen - The sculpture was inspired by the famous writer Hans Christian Anderson and was placed in the harbor in 1913. The Round Tower (Rudetarn) - This astrological observatory is the oldest of its kind still utilized in Europe. Oresund Bridge - This famous bridge connects Denmark to Sweden. Amalienborg Castle in Copenhagen - Two of the castle's palaces are open to the public. Assistens Kirkegard Cemetery - This cemetery is resting place to many acclaimed people in history including the author Hans Christian Anderson and the scientist Niels Bohr. Cliffs of Mon - These cliffs are a must see natural landmark. Legoland - Since the Danes invented the Lego it is only fitting that one of the best Legolands would be in Denmark. Legoland is located in the city of Bullund and spans 25 acres of primary coloured blocks. Smorrebrod - An open Danish sandwitch with varations such as beef and tartar with a side of potatoe chips. Danish Hot Dog Stands - Hot Dog Stands in Denmark sprang up everywhere during WWII. Danish Licorice - You can find licorice flavored sweets, such as ice cream and mints. Beer - Demark is home to many local breweries. Vandgrød - This is oatmeal with barley. For more information on Denmark visit the CIA World Factbook.